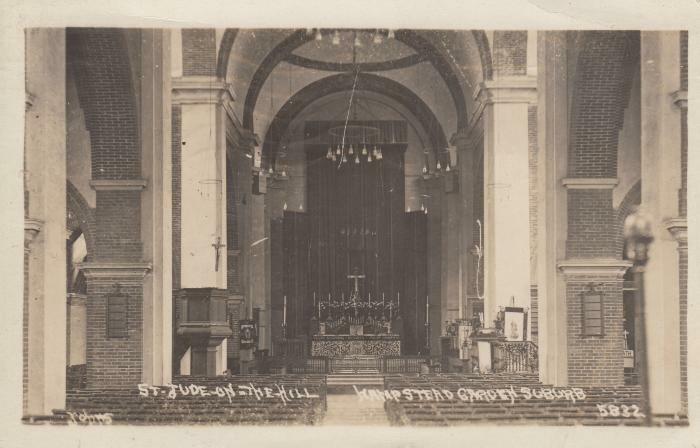 Postcards of St. Jude-on-the-Hill, forming part of the Raymond Lowe collection. St. Jude's is the most famous and most striking building in the Suburb. The tower is the finest part of the whole building. It can be seen from as far away as Horsenden Hill, Greenford. The site for the churches was selected long before any houses had been built and was chosen for it's pre-eminence over the site of the Suburb. After a number of designs were put before the buildings committee by Edwin Lutyens the design for the church, as we know it now, was accepted. It was one of the few times when Henrietta Barnett did not get her own way. She had wanted a Gothic church similar to her husband's church St. Jude's Whitechapel, there is not a pointed arch in the entire building. The present St. Jude's is named after the Whitechapel church which was demolished in 1923. The site for the church was dedicated by the Archdeacon of London. The first sod was cut by Mrs Barnett on 28th October 1909 during a rain storm which she described as a hurricane. The foundation stone was laid on 25ft April 1910 by the Earl of Crewe and the Hon. W. F. D. Smith. The first part of the building to be used was the Lady Chapel, which seated 120 worshippers. It was consecrated by the Bishop of Islington 28th October 1910. The silver sanctuary lamp was presented by Lady Battersea in memory of Canon Samuel Barnett who died June 1913, it is the first of a number memorials in the church. The church itself was consecrated 7n May 191 I by the Bishop of London, Dr. R. P. WinninEon Ingram. The tower and spire were dedicated by the same bishop in 1913. The east end of the building was completed in 1923 when the apse behind the high altar, the Harmsworth memorial chapel, now called St. John's Chapel and the vestries were constructed. The Father Willis organ was brought from Whitechapel in 1923 and erected on the west end gallery. The final stage of completion was carried out in 1934135 when the west end was built and the gallery taken down. The west end is a memorial to the first vicar. The Father Willis was moved to it's present position in the choir. The two lofts were designed by the organ builders Hill, Norman and Beard mounted on the Lutyens designed wooden truscan columns reused from the dismantled gallery. The church is possibly unique in being the only 20th century church to be entirely decorated throughout with murals. These were painted by Walter P. Starmer. There are many cards of St. Jude's , but to date I have never seen one of the gallery with the Father Willis organ in its' first position in the church. The stained glass window in the Harmsworth Chapel was designed by Anning Bell after a sketch by Lutyens.From the cards I have the various changes to the interior can be charted.